​The Route 519 Corridor Safety Improvement project is in North Strabane Township, Washington County — part of PennDOT's District 12. It is approximately 1.5 miles long and extends on Route 519 from the Interstate 79 ramps to the Route 980/U.S. 19 ramp. This portion of Route 519 is a highly traveled major roadway and has an average daily traffic count of 16,000 vehicles. It is a popular cut through for Interstate 79 and U.S. 19 traffic and serves as an emergency interstate detour route for both Interstates 79 and 70. 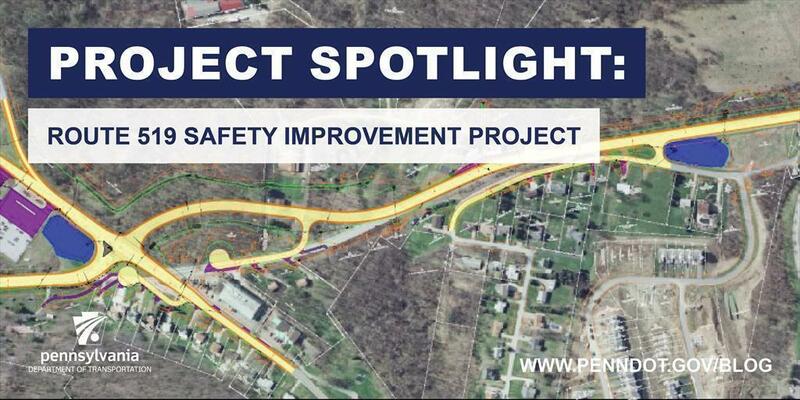 With this project, the Route 519 corridor will be widened from the Interstate 79 ramps to the Route 19 ramp intersection. A two-way center left turn lane will be provided. Three new traffic signals will be installed, one at each of the 79 ramps and the third at the intersection of Route 519 and U.S. 19 ramps. Exclusive turn lanes will be provided in certain locations along the length of Route 519 and widening will occur along Interstate 79 ramps and Route 980 to accommodate exclusive turn lanes. A portion of the Route 519 alignment will be relocated offline at its intersection with Route 980/U.S. 19 to allow for better traffic flow. Minor shifts to Acme Road and Chesnic Drive will be made to better align with Route 519. Other safety improvements include the realignment of Carol Drive, installation of two cul-de-sacs, high-friction surface treatments, delineation, guiderail upgrades, and rumble strips. This project is considered a high-crash location by the department. The three intersections mentioned above have crash clusters with the majority being angular type crashes. Turning lanes will be constructed at these intersections to provide increased safety and level of service and reduced congestion. All improvements will be done for safety, based on crash history. This project is presently scheduled to be let in the fall of 2018 with construction scheduled for 2019 and 2020.